I wanted to do a little fall spruce up in the kitchen for the weekend. I love picking up seasonal flowers in the supermarket floral department, inexpensive and convenient. The sunflowers and hydrangeas caught my eye, perfect for transitioning from summer to fall. I still have my table vignette to do, pulling out containers from storage and I’ll do that this weekend. 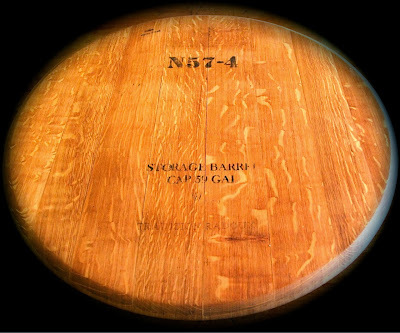 For the island I took my wine barrel lazy susan that I use on the table and put it on the island. Added my Anthro sugar and creamer and there you have, easy and simple. I’m sure this will change a dozen times for the Autumn season. Using champagne buckets to hold topiaries and a favorite container for the hydrangeas. All ready for the weekend! Thanks for your visit, hope you’ll take a minute to leave a comment and let me know you stopped for a visit. There is nothing like fresh flowers to liven up a room. I love your sunflowers and hydrangeas and the blues in your decor. Your kitchen looks very festive and lovely. I *really* love your Roo!! 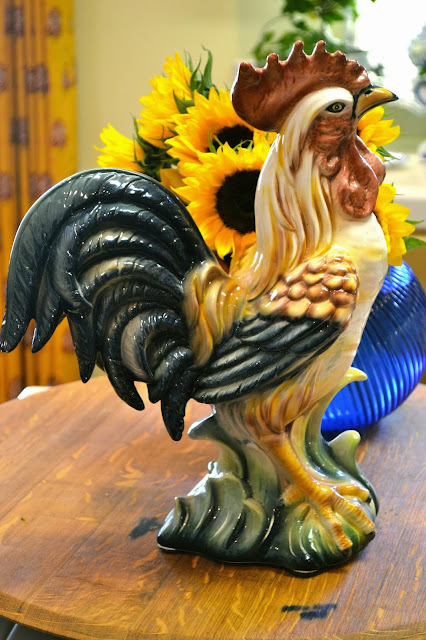 You can't go wrong with roosters and sunflowers in a cobalt vase, Emily! 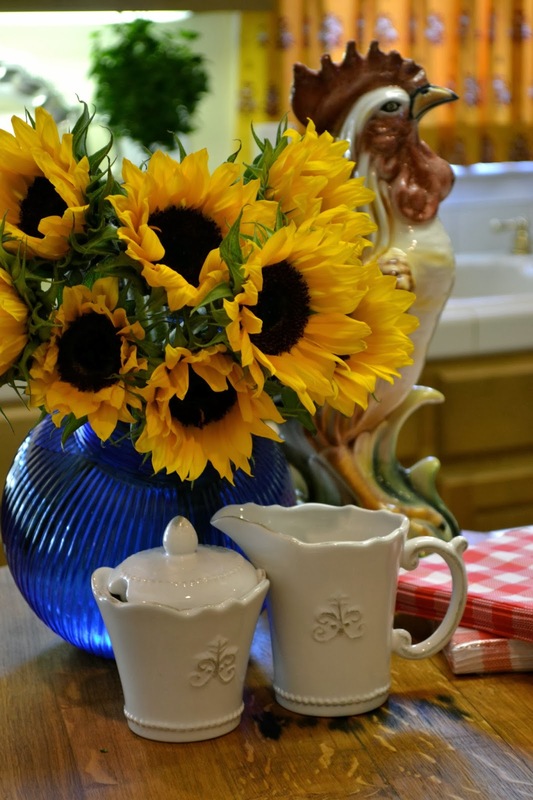 Love the sunflower vignette with Roo. A great look.. Everything you shared is so lovely. The lazy susan is beautiful and I know it will make a lovely base for anything you do. 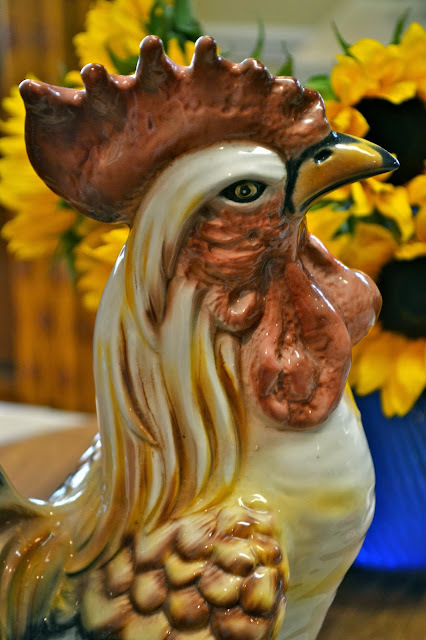 All the yellows and blues are so pretty along with the rooster. 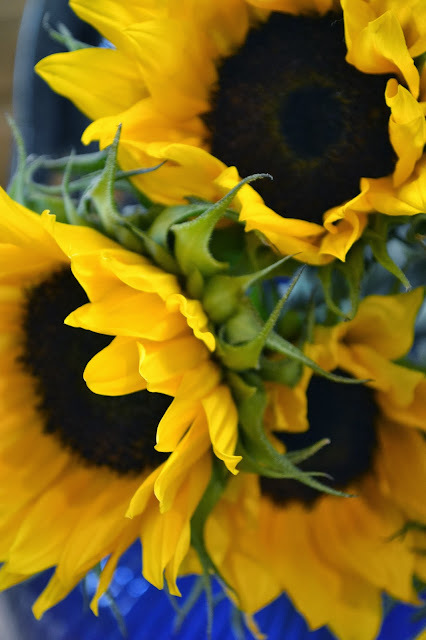 What a beautiful photo of the sunflowers! I love both sunflowers and hydrangeas! It' a gorgeous time of the year. Good morning! What a cute display---very festive! I've been on vacation most the month so I'm hoping to get my fall stuff up this weekend. When I left, it was still 90 degrees!! 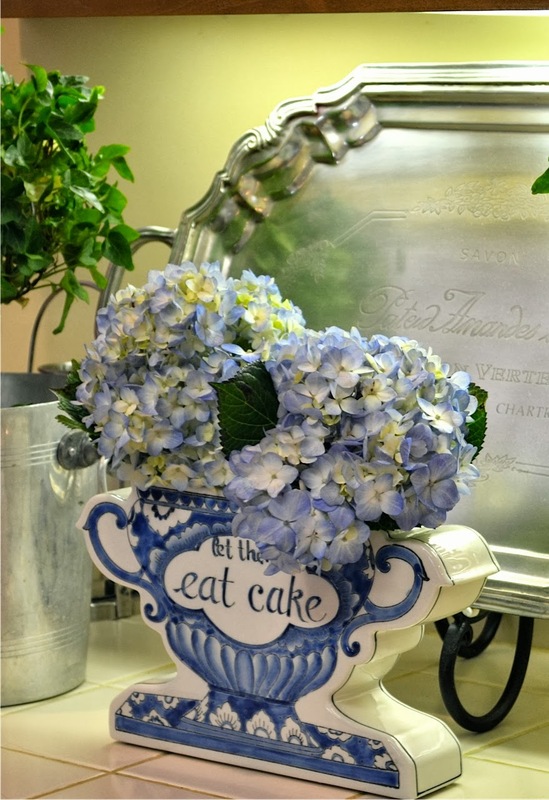 I love how you displayed your hydrangeas! Your kitchen is so pretty, Emily, and I love the rooster--I have a similar one in my kitchen window! Also I am a sucker for sunflowers. I've had some in the garden that I've been picking, but the rainy season has started here, so don't know how much longer they will last outside. Your look beautiful in the blue container. Nice to hear from you today! Thanks for the inspiration. I needed a boost. 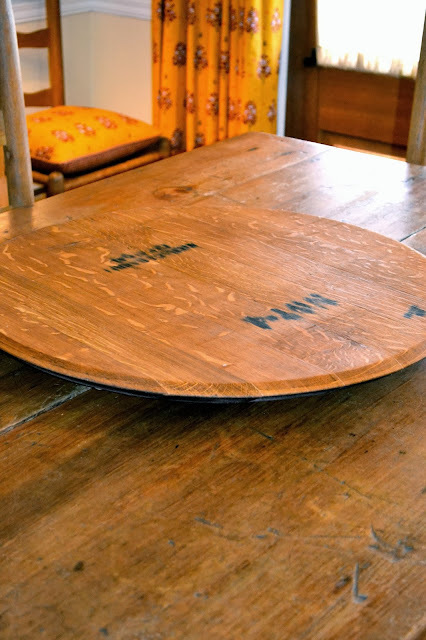 A lazy susan makes such a nice feature on a pretty table! What a beauty! As beautiful as anything I could imagine from you! It's lovely in every way! Emily, your vignettes are so pretty! 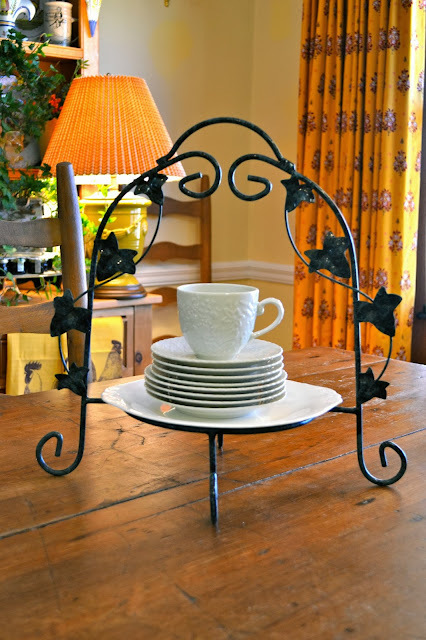 I just love to pop in and see your gorgeous decor! Love the sunflowers and hydrangeas...two of my favorite flowers. Can't wait to see more! 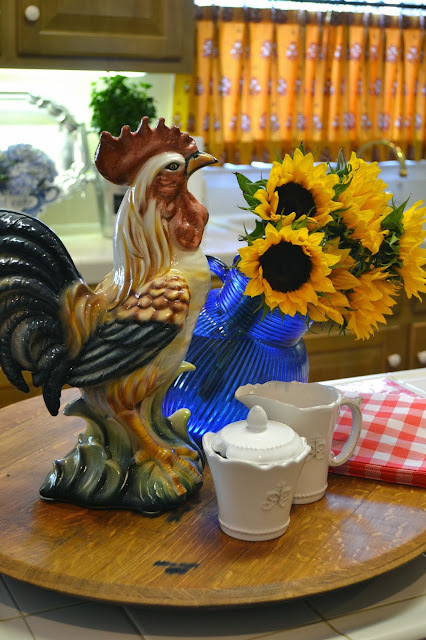 Beautiful images Emily, I the shot with the rooster peeking his head out from behind the sunflowers. I am so ready to welcome fall. What a nice gift you were given! I love lazy Susans. They are so convenient, aren't they!? Your table arrangement is so pretty and loving your vintage French wine buckets too.